In order to reach the top of a mountain, we must have to start from the bottom or lower part of it. Prior to knowing about the communication and its complex procedures and interfacing, we have to know about some of its basic concepts and information. So, this chapter gives a brief idea on basic definitions, modulation concept, basic protocols, OSI model, and so on. Radio: A radio system usually includes both: a source of electromagnetic wave, and an intended destination for that message. A source radio is referred to as the transmitter while the destination radio is referred to as the receiver. Frequency: The time taken to execute a number of electromagnetic wave cycles per sec is called as frequency. Electromagnetic spectrum: The electromagnetic spectrum is the range of all possible frequencies of an electromagnetic radiation. The grouping of radio frequencies is called band frequencies, which are used by wireless communications like GSM, GPS, RF, Zigbee and other wireless communications systems. A high-frequency band phone supports communication over long distances. The band frequency is measured in Hertz. For example, a GSM network works with around 1900MHz; RF communication works with around 433 MHz frequency. The difference between the upper frequency and the lower frequency is called band width like 400 MHz – 868 MHz. 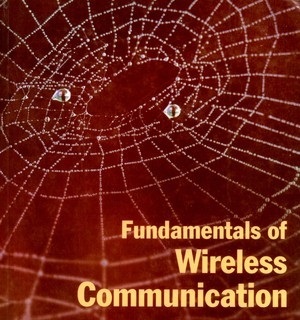 A communication device works normally within a given range and disconnects the communication outside the range of the frequency band, which is observed by the base-band filter in the wireless module. The ISM bands are various sections of the RF spectrum set aside worldwide by the governing bodies, such as the Federal Communications Commission (FCC) in the U.S. The most common uses of these ISMbands include RFIDs, Bluetooth, RFIS, cordless phones and Wi-Fi. 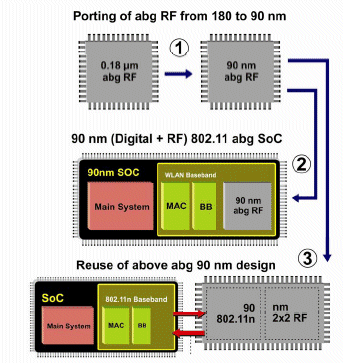 RF-system-on-a-chip (i.e., “RF-SoC”) means that the RF/analog/digital circuits are all integrated with their memory blocks and microprocessors/DSP integrated on a single chip. The primary advantage of a single-chip RF-SoC is that the component is less susceptible to external noise pickup, cost-effective and have long life. We are living in an era of communication wherein we can easily transfer any information (video, audio and other data) in the form of electrical signals to any other device or destined area. Although it is common in our perceptual experience that sending or receiving signals or data is simple, but it involves quite complex procedures, possibilities and scenarios within the communication systems. Modulation plays a key role in communication system to encode information digitally in analog world. It is very important to modulate the signals before sending them to the receiver section for larger distance transfer, accurate data transfer and low-noise data reception. Modulation is a process of changing the characteristics of the wave to be transmitted by superimposing the message signal on the high-frequency signal. In this process, video, voice and other data signals modify high-frequency signals – also known as carrier wave. This carrier wave can be DC or AC or pulse chain depending on the application used. Usually a high-frequency sine wave is used as a carrier-wave signal. Why Modulation Is Used in Communication? In signal transmission, the signals from various sources are transmitted through a common channel simultaneously by using multiplexers. If these signals are transmitted simultaneously with certain bandwidth, they cause interference. To overcome this, speech signals are modulated to various carrier frequencies in order for the receiver to tune them to desired bandwidth of its own choice within the range of transmission. Another technical reason is antenna size; the antenna size is inversely proportional to the frequency of the radiated signal. The order of the antenna aperture size is at least one by tenth of the wavelength of the signal. Its size is not practicable if the signal is 5 KHz; therefore, raising frequency by modulating process will certainly reduce the height of the antenna. Modulation is important to transfer the signals over large distances, since it is not possible to send low-frequency signals for longer distances. Similarly, modulation is also important to allocate more channels for users and to increase noise immunity. There are two types of modulation: analog and digital modulation. These techniques have already been discussed. 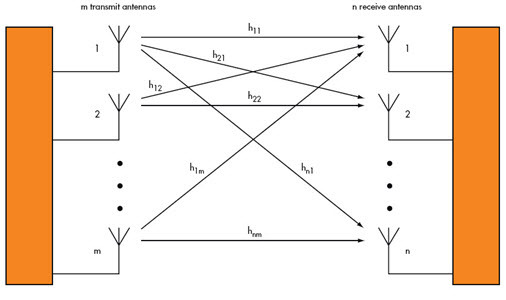 In both the techniques, the baseband information is converted to radio frequency signals, but in analog modulation these RF communication signals have continuous range of values, whereas in digital modulation these are in prearranged discrete states. Amplitude Modulation: The amplitude of the carrier wave is varied in proportion to the message signal and the other factors like frequency and phase remain constant. The modulated signal is shown in the below figure, and its spectrum consists of lower-frequency band, upper-frequency band and carrier-frequency components. This type of modulation requires greater band width, and more power. Filtering is very difficult in this modulation. Frequency Modulation (FM):FM varies the frequency of the carrier in proportion to the message or data signal while maintaining other parameters constant. The advantage of FM over AM is the greater suppression of noise at the expense of bandwidth in FM. It is used in applications like radio, radar, telemetry seismic prospecting, and so on. The efficiency and bandwidths depend on modulation index and maximum modulating frequency. Phase Modulation: the carrier phase is varied in accordance with the data signal. In this type of modulation, when the phase is changed, it also affects the frequency, so this modulation also comes under frequency modulation. Analog modulation (AM, FM and PM) is more sensitive to noise. If noise enters into a system, it persists and gets carried till the end receiver. Therefore, this drawback can be overcome by the digital modulation technique. For a better quality and efficient communication, digital modulation technique is employed. The main advantages of the digital modulation over analog modulation include permissible power, available bandwidth and high noise immunity. In digital modulation, a message signal is converted from analog to digital message, and then modulated by using a carrier wave. The carrier wave is keyed or switched on and off to create pulses such that the signal is modulated. Similar to the analog, here the parameters like amplitude, frequency and phase variation of the carrier wave decide the type of digital modulation. Digital modulation is of several types depending on the types of signal and applications used such as Amplitude Shift Keying, Frequency Shift Keying, Phase Shift Keying, Differential Phase Shift Keying, Quadrature Phase Shift Keying, Minimum Shift Keying, Gaussian Minimum Shift Keying, Orthogonal Frequency Division Multiplexing, etc., as shown in the figure. Amplitude shift keying changes the amplitude of the carrier wave based on the base-band signal or message signal, which is in digital format. It is used for low-band requirements and is sensitive to noise. In frequency shift keying, the frequency of the carrier wave is varied for each symbol in the digital data. It needs larger bandwidths as shown in the figure. Similarly, the phase shift keying changes the phase of the carrier for each symbol, and it is less sensitive to noise. To avoid making this description complex, some mathematical equations and in-depth information about digital communication systems have been exempted from it. In recent years, an efficient design of a Wireless Sensor Network (WSN) has become a leading area of research. A sensor is a device that responds and detects some type of input from both the physical or environmental conditions, such as pressure, heat, light, etc. 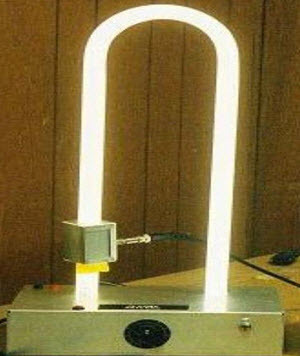 The output of the sensor is generally an electrical signal that is transmitted to a controller for further processing. Electrically-coded information is called as serial data, which is transmitted bit-by-bit from one device to another through a set of protocols. In the embedded system, control sensors and actuators data is received or transmitted to the controller devices such as microcontrollers so that the data is further analyzed and processed. As the microcontrollers work with the digital data, the information from analog sensors, actuators and other peripherals is converted into one byte (8-bit) binary word prior to being transmitted to the microcontroller. This serial data is transmitted with respect to certain clock pulse. The data transmission rate is referred to as the baud rate. The number of data bits that can be transmitted per second is called as baud rate. Suppose the data is of 12 bytes, and then each byte is converted into 8 bits so that the total size of the data transmission is about 96 bits/sec of the data (12bytes*8 bits per byte). If the data can be transmitted once every second, the baud rates are around 96 bits/sec or 96 baud. The display screen refreshes the data value once every second. Protocol: A set of rules and regulations followed to transfer data is called as a protocol. Communication: Exchange of information from one system to another system with a medium is called a communication. Communication Protocol: A set of rules and regulations that allow two electronic devices to connect to exchange the data with each other. 1. Inter System Protocol: The inter system protocol is used to communicate two different devices like communication between a computer and a microcontroller kit. The communication is done through an interbus system. 2. Intra System Protocol: The intra system protocol is used to communicate two devices within a circuit board. While using this intra system protocol, the complexity of the communication is reduced by expanding the peripherals. The circuit complexity and power consumption can be increased by using intra system protocol. Using intra system protocols circuit, the complexity and power consumption cost can be decreased, and it is very secure for accessing data. UART stands for universal asynchronous transmitter and receiver. UART Protocols is a serial communication with two-wired protocol. The data-cable signal lines are labeled as Rx and Tx. Serial communication is commonly used for transmitting and receiving the signal. It transfers and receives the data serially bit-by-bit without class pulses. The UART take bytes of data and sends the individual bits in sequential manner. UART is a half-duplex protocol. Half-duplex means transferring and receiving the data, but not at the same time. Most of the controllers have hardware UART on board. It uses a single data line for transmitting and receiving the data. It has one start bit, 8-bit data and one stop bit mean the 8-bit data transfer ones signal is high to low. Ex: Emails, SMS, Walkie-Talkie, etc. USART stands for universal synchronous and asynchronous transmitter and receiver. It is a serial communication of two-wire protocol. The data-cable signal lines are labeled as Rx and TX. This protocol is used for transmitting and receiving the data byte-by-byte along with the clock pulses. It is a full-duplex protocol means transmitting and receiving data simultaneously to different board rates. Different devices communicate with microcontroller with this protocol. The SPI communication stands for serial peripheral interface communication protocol, which was developed by the Motorola in 1972. SPI interface is available on popular communication controllers such as PIC, AVR, and ARM controller, etc. It has synchronous serial communication data link that operates in full-duplex, which means, the data signals carry on both the directions simultaneously. SPI protocol consists of four wires such as MISO, MOSI, CLK, SS used for master/slave communication. The master is a microcontroller, and the slaves are other peripherals like sensors, GSM modem and GPS modem, etc. 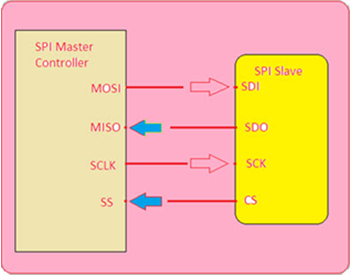 Multiple slaves are interfaced to the master through a SPI serial bus. The SPI protocol does not support the multi-master communication, and it is used for a short distance within a circuit board. MISO (Master in Slave out): The MISO line is configured as an input in a master device and as an output in a slave device. MOSI (Master out Slave in): The MOSI is a line configured as an output in a master device and as an input in a slave device wherein it is used to synchronize the data movement. SCK (Serial Clock): This signal is always driven by the master for synchronous data transfer between the master and the slave. It is used to synchronize the data movement both in and out through the MOSI and MISO lines. SS (Slave Select) and CS (Chip Select): This signal is driven by the master to select individual slaves/Peripheral devices. It is an input line used to select the slave devices. Master Slave Communication with SPI Serial Bus. Here, the communication is always initiated by the master. The master device first configures the clock frequency which is less than or equal to the maximum frequency that the slave device supports. The master then selects the desired slave for communication by dragging the chip select line (SS) of that particular slave device to go low state and active. The master generates the information on to the MOSI line that carries the data from the master to the slave. This is a multiple slave configuration with one master and multiple slaves through the SPI serial bus. 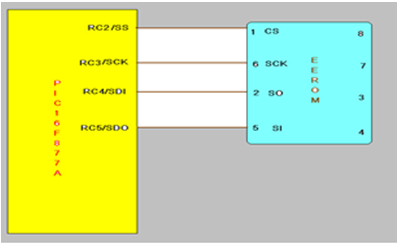 The multiple slaves are connected in parallel to the master device with the SPI serial bus. Here, all the clock lines and data lines are connected together, but the chip select pin from each slave device must be connected to a separate slave select pin on the maser device. In this process, the control of each slave device is performed by a chip select line (SS). The chip select pin goes low to activate the slave device and goes high to disable the slave device. The data transfer is organized by using the shift registers at both the master and slave devices with a given word size of about 8-bit and 16-bit, respectively. Both the devices are connected in a ring form so that the maser shift register value is transmitted through the MOSI line, and then the slave shifts data in its shift register. The data is usually shifted out with the MSB first and shifting new LSB into the same register. Generally the transmission and reception of data is performed with respect to the clock pulses at the rising edges and falling edges. The Advanced microcontrollers have two frequencies: internal frequency and external frequency. 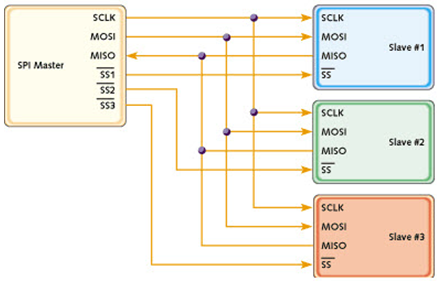 The SPI peripherals can be added by sharing the MISO, MOSI and SCLK lines. The peripherals are of different types or speeds like ADC, DAC, etc. So, we need to change the SPCR settings between the transfers to different peripherals. 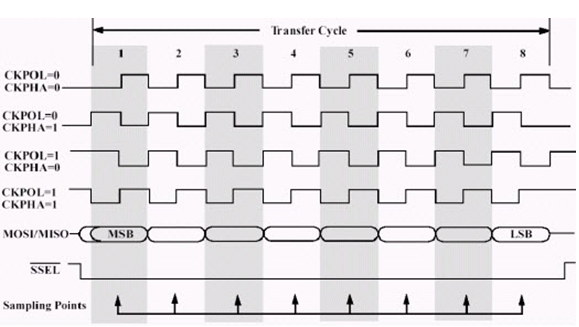 The SPI bus operates in one of the 4 different transfer modes with a clock polarity (CPOL) and clock phase (CPHA) which defines a clock format to be used. The clock polarity and the phase clock rates depend on which peripheral device you are trying to communicate with the master. CPHA=0, CPOL=0: The first bit starts as a lower signal – the data is sampled at rising edge and the data changes on falling edge. CPHA=0, CPOL=1: The first bit starts with a lower clock – the data is sampled at falling edge and the data changes on rising edge. CPHA=1, CPOL=0: The first bit starts with a higher clock – the data is sampled at falling edge and the data changes on rising edge. CPHA=1, CPOL=1: The first bit starts with a higher clock – the data is sampled at rising edge, and the data changes on falling edge. Many microcontrollers have inbuilt SPI protocols that handle all of the sending and receiving data. Any of the data mode operations (R/W) is controlled by a control and status registers of the SPI Protocol. Here, you can observe the EEPROM interface to the PIC16f877a microcontroller through the SPI protocol. Here, 25LC104 EEROM is a 131072 bytes memory wherein the microcontroller transfers two bytes of data to the EEROM memory through a SPI serial bus. The program for this interfacing is given below. It is a full-duplex communication. It is high-speed data bus 10MHzs. It is not limited to 8bits while transferring. Hardware interfacing is simple through SPI. Slave uses a master clock and doesn’t need precious oscillators. The RS-232(X) is a communication cable, commonly used for transferring and receiving the serial data between two devices. It supports both synchronous and asynchronous data transmissions. Many devices in the industrial environment are still using RS-232 communication cable. Rs-232 cable is used to identify the difference of two signal levels between the logic 1 and logic 0. The logic 1 is represented by -12V, and the logic 0 is represented by +12V. The RS-232 cable works at different baud rates like 9600 bits/s, 2400bits/s, 4800bits/s, and so on. The RS-232 cable has two terminal devices namely Data Terminal Equipment and Data Communication Equipment. Both the devices send and receive the signals. The data terminal equipment is a computer terminal, and the data communication equipment is a modem, or controller. Nowadays most of the personal computers have two serial ports and one parallel port (RS232). These two types of ports are used for communicating with the external devices, and they work in different ways. The parallel port sends and receives an 8-bit data at a time over eight separate wires and this transfers the data very quickly. The parallel ports are typically used to connect a printer to a PC. A serial port sends and receives one-bit data at a time over one wire and transfers data very slowly. The RS-232 stands for recommended standard and 232 is a number X, which indicates the latest versions like RS-232c, RS232s. 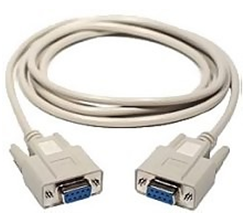 The most commonly used type of serial cable connectors are 9-pin connector DB9 and 25-pin connector DB-25. Each of them may be male or female type. Nowadays most of the computers use DB9 connector for asynchronous data exchange. The maximum length of RS-232 cable is 50ft. PIN 1: (Protective Ground); It is a ground Pin. PIN 2 & PIN 3: These pins are most important pins for data transmission and reception. 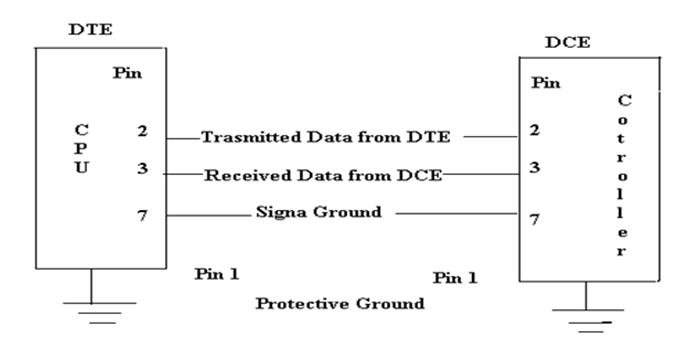 The 1 & 2-pins are used for transmitting data, and the pin-3 is used for data receiving purpose. PIN 4, PIN 5, PIN 6, and PIN 20: These pins are the handshaking pins (flow of control). Normally terminals cannot transmit the data until a clear to send transmission signal is received from the DCE. PIN 7: This pin is the common reference for all signals, including data, timing, and control signals. The DCE and DTE work properly across the serial interface. The pin-7 must be connected to both ends as without interface it will not work. PIN 8: This pin is also known as received line signal detect or carrier detect. This signal is activated when a suitable carrier is established between the local and remote DCE devices. PIN9: This pin is DTE serial connector; this signal follows the incoming ring to an extent. Normally this signal is used by a DCE auto answerable mode. PIN 15, 17, 24; Synchronous modems use the signals on these pins. These pins control bit timing. PIN 21 (Signal Quality Detector): This pin indicates the quality of the received carrier signal because the transmitting modem must be send 0 or either 1 at each bit time. The modem controls the timing of the bits from the DTE. PIN 22(Ring Indicator): A ringing indicator means the DCE informs the DTE that the phone is ringing. All the modems designed for direct connection to a phone network are equipped with auto answer. PIN 23: Data Signal Rate Detector. The Max 232 IC consists of two transmitter-receiver arrangement such that two serial ports can be connected using the same chip. 5 capacitors of each 1microFarad are used to generate the required RS232 standard voltage from the TTL/CMOS voltage. The transmitters convert the TTL/CMOS level to RS232 level, whereas the receiver receives the RS232 input and converts that to TTL level voltage. Typical applications of Max232 involve modems, computers, RS232 systems and terminals. For a typical working application involving Max 232 as an intermediate between the microcontroller and the RS 232 connected to the computer, one of the transmitter input pins receives TTL input from the Microcontroller, and the capacitor arrangement obtains the +/-10V signal, which is applied to the corresponding transmitter output pin given to the RS232 port. The receiver input pin receives 232 standard input from the RS232 port and accordingly the corresponding receiver output pin gives the TTL standard output to the microcontroller. 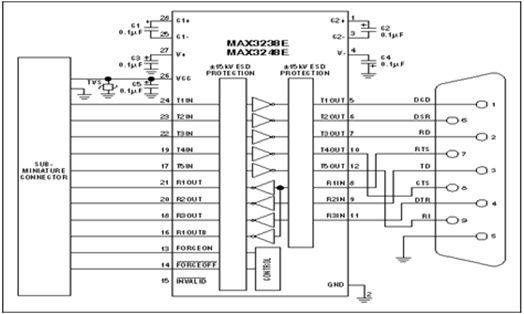 Thus, the Max 232 IC can be used as an intermediate connection between a microcontroller and a computer. 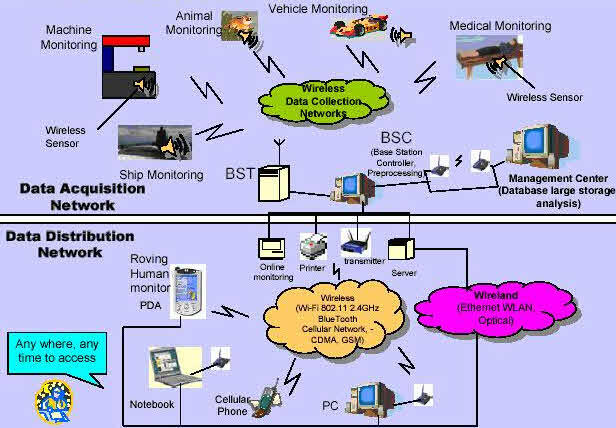 A system used for transferring the data between persons and equipment is called communication system. The system usually consists of individual communication networks, relay stations, transmission system, terminal equipment, interconnection cable and inter-operations performing as an integrated whole. Antenna plays a crucial role in this communication system, which is used to transmit and receive the data. The classification of the antenna is based on the specifications like frequency, polarization, radiation, etc. The antenna that is operated at microwave frequency is knows as microwave antenna. There are different types of microwave antennas over a wide range of applications including home- communication-based applications. These antennas are also known as patch antennas. 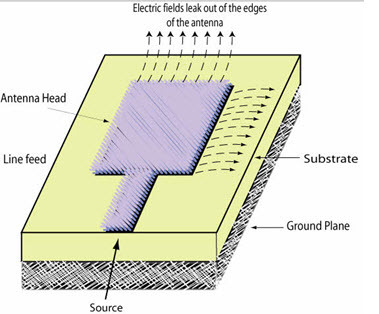 A micro-strip patch antenna consists of a radiating patch that is bonded to a dielectric substrate on one side and has a ground plane on the other side. The patch is generally composed of conducting materials like copper or gold. The operational frequency of these antennas range between 100 MHz and 100 GHz. Due to the advantages like less weight, low volume and low fabrication cost, these antennas can be manufactured in large quantities. The micro strip patch antennas are well-known for their performance and extent of usage. The usage of micro-strip antennas in the wide range could take over the usage of conventional antennas in applications. There are several applications that use the micro-strip patch antennas, such as global positing satellites, cellular phones, personal communication system and paging devices. 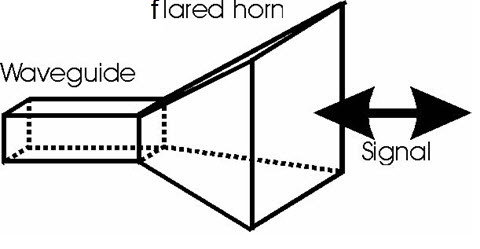 The Horn antenna or Microwave Horn is an antenna consisting of a waveguide whose end walls are flared outside to form a megaphone like structure, as shown in the below figure. These horns are widely used as antennas at ultra-high frequencies and microwave frequencies that are well above 300 MHz. These are used to measure the gain of other antennas as calibrating antennas and directive antennas for devices like automatic door openers and microwave-radio meters. The advantages of the horn antenna include moderate directivity, low-standing wave ratio and broad bandwidth. The gain of horn antenna ranges upto 25 db. These are extensively used at microwave frequency when the power gain needed is moderate. A parabola antenna is an antenna that uses a parabolic reflector, a curved surface with cross sectional shape of a parabola to direct the radio waves. 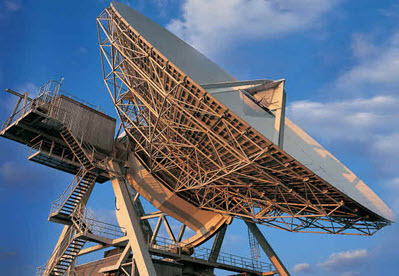 The shape of the antenna is in the form of a dish; therefore, it is popularly known as dish antenna or parabolic dish. High directivity is the main advantage of the parabolic antenna. These antennas find their applications as high-gain antennas for point-to-point communication and also as radio telescopes. In addition to this, the parabolic antennas are also used as radar antennas because in radars there is a need for transmitting a narrow beam of radio waves to local objects like ships, airplanes, etc. A plasma antenna is a type of radio antenna in which the plasma is used as a development element instead of the metal elements that are used in traditional antenna. It uses ionized gas as a conducting material because this gas ionizes when transmission or reception takes place. The Plasma antennas can be used for both transmission and reception of the radio signals as they are capable of operating up to 90 GHz frequency range. The plasma antenna has high-frequency cutoff .It can transmit and receive high and low-frequency signals while not interacting with the high-frequency signals. The applications of the plasma antenna are high speed digital communications, electronic intelligence, RFID, 4G and radar systems. In radio, multiple-inputs and multiple-outputs or MIMO are used, and therefore, the multiple antennas are used at both the transmitter and receiver ends to improve communication’s performance. It is one of the smartest antenna technologies. The multiple antennas in MIMO can be exploited in two ways: one is for the creation of highly effective antenna directivity, and the other is for transmitting the parallel data streams to increase the capacity of the system. The applications of the MIMO antennas are mesh networks and RFID systems. The above described various micro-wave antennas are essential devices in wireless communication systems and also in satellite, radio and radar communications. Whenever a group of tasks is assigned to a system, the OSI layers divide the task, and then assign it for each of the 7-layers for sending the information between networked systems. Each layer is reasonably self-contained so that the tasks assigned to each layer can be implemented independently. 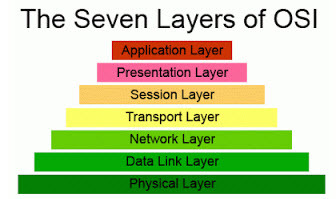 Most wired and wireless systems use at least the first four layers, but many do not use all seven layers of the OSI model. If you want to implement any wireless module, you can develop the code for the required layer using a “Contiki” operating system. The application layer provides the application services for file transfers, email and other network software services. The presentation layer is responsible for the delivery and formatting of information to the application layer for further processing. The presentation layer converts the data from the application task to a network format and vice versa, and then sends to the network so that the application layer can accept. This layer manages and terminates the connections between applications. The session layer sets up, coordinates, exchanges, and terminates conversations, between the applications at each end. This layer provides transfer of data between end systems, or hosts, and is responsible for end-to-end error recovery and flow control. It ensures complete data transfer. Network layer provides data routing paths for network communication. Data is transferred in the form of packets via logical network paths in an ordered format controlled by the network layer. The Media Access Control layer: The MAC layer is responsible for moving the packets of data to the network nodes. Logical Link Control (LLC) layer: The LLC layer controls frame synchronization, flow control and error checking of data. Physical Layer: The physical layer deals with the bit-level transmission between different devices and supports electrical or mechanical interfaces by connecting to the physical medium for synchronized communication. It provides the hardware means of sending and receiving data on a carrier, including defining cables, cards and physical aspects. Fast Ethernet, RS232, and ATM are protocols with physical layer components.